The American in Canada by Canada by T. Ritchie of Transition Financial. As you can see it is available from Amazon.com and from the author’s site. Since the summer 0f 2011 I have been learning more and more about the problems of being a U.S. citizen and living outside the United States. 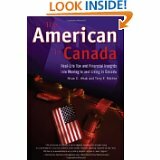 This book focuses on the experience of being an American in Canada. As a result not all the information will be applicable to those of you living in the rest of the world. But, what I liked about the book was that it identified a number of issues that you must be concerned with (regardless of where you live). In addition, it provides good insight into how to plan certain aspects of your life. Furthermore, you will learn about aspects of the U.S. tax and reporting system that would apply even if you lived in the U.S.
Disclaimer: I don’t know the author(s). This is just offered as a helpful resource that discusses a number of issues under one cover. Check to see what the latest edition is before you but it. It is very reasonably priced. This entry was posted in Citizenship-based taxation on January 9, 2012 by renounceuscitizenship. Thanks for your kind comments about our book. We are in the process of updating the next edition of the book. We have purposely been putting off the update in light of all of the “wonderful changes” that have been imposed over the last little while by the IRS and the present US administration. Course, now we have additional news today of the 3rd go round of the Offshore Voluntary Disclosure Initiative (OVDI). No end date on this program. http://www.irs.gov/newsroom/article/0,,id=252162,00.html Guess third time is the charm! The third time will NOT be the charm. The program is badly flawed because it presumes everybody is a criminal. The IRS has not (at least to date) provided a risk free way for law abiding U.S citizens who live outside the U.S. to enter the U.S. tax and reporting system. They will simply drive people underground. So, I take it the 2008 edition is the most recent edition of your book. Look forward to the newest edition – hope is available for e-readers. Appreciate your comments and recent post. I was being facetious about my “third time is the charm” quote. That would be from the IRS’s perspective. The 2008 edition is presently the most recent edition. Will be working on the next edition shortly. Attached you will find a link to a presentation on this “crap” I gave to the Canadian Institute of Advanced Financial Planners a few months back. Doing another one to the international members of the US based Financial Planning Association tomorrow morning. Thank you for this – that was an excellent presentation – great source of information in one place. If you have revised the presentation for the one tomorrow would love to see it. I take it the one on Jan. 11 is in the U.S. The content would be somewhat different?